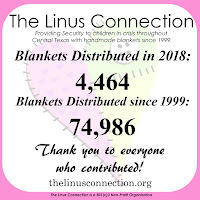 An extra special thanks to all of our volunteers for their hard work and generosity in helping us fill the needs of not only those facilities that we support on a regular basis, but by working extra hard to get Linus blankets into the hands of children affected by the Central Texas fires. We will continue to fill the needs of all of our recipient facilities, including those working with fire victims, so keep those blankets coming! Thank you to everyone that has already brought in their Stars For Stephanie! 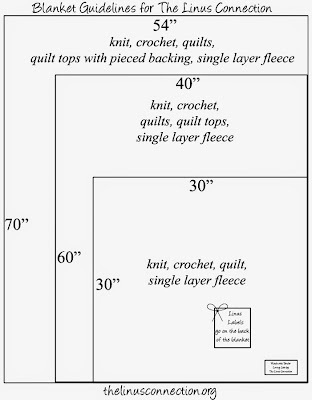 If you have not yet printed your pattern, you can find it in the original post or just click here for the printable pattern. All Stars are due by Monday, September 26. Please click here for details. Challenge blankets will be shown during our 12th Birthday Celebration October 15, 2011 and there will be prizes for Viewer's Choice. Please remember, blankets are due no later than 9 o'clock so that the can be hung for display as quickly as possible. Volunteers, please bring a snack or tasty treat to share. We will have special guests and a very special announcement! Read more about the Challenge and how to participate. Work Day at Sew SomethingWe will have our first Linus Work Day at Sew Something on Saturday October 8, 2011 to sew up some of the kits cut by our awesome volunteers at the August meeting. Terri, the owner of Sew Something has a lovely studio area for sewing, including sewing machines for those that need them. You are also welcome to bring your own sewing machine. Quilt Kits will be provided. 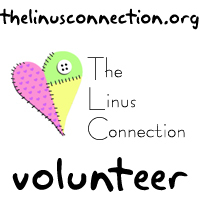 Blanket Guidelines ReminderIn order to maintain the high standards our recipient facilities and the children they represent have come to expect from Linus blankets, we ask that every volunteer occasionally re-read our Blanket Guidelines. Please remember, quilts must have batting, need to be either hand-tied or quilted (machine or hand) and need to be finished securely, preferably using Double Fold French Binding. Yarn blankets need to have all tails woven in. Quilt fabrics need to be 100% cotton, washable quilting fabric. Yarn blankets should be soft washable acrylic. 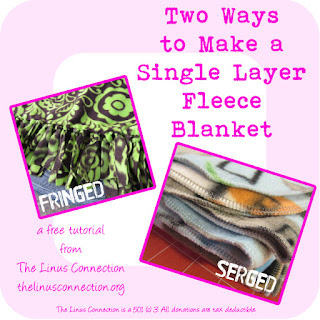 Full Blanket Guidelines can be found here. If you have questions about the Blanket Guidelines, please feel free to contact us. We are still collecting crayon blocks to provide to youth groups and school children. Blocks need to be made with an 8 1/2" square of muslin with 2 1/2" matching sashing. Please iron a piece of freezer paper on the back of the muslin to make it easier for the children to color. Finished blocks are collected at each monthly meeting. Blankets were shown and donated on September 17, 2011. They are not necessarily being shown by the person that made them. 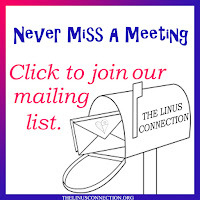 We encourage you to join us at our monthly meeting and participate in Show and Tell at 10 a.m.
Click on any photo to enlarge. Opens in a new window or tab. Seeing double? These lovely donations from Girl Scout Troop 2084 came in pairs! Did you miss our Timeless Treasures post? Here are those gorgeous quilts one more time! Follow our blog with Bloglovin. lovely to see all the quilts! I'm sorry there weren't enough this month. Hopefully next month will bring in more. The quilts and afghans that made it there this month are just beautiful and will truly be appreciated by kids!! !